Karachi (Agenzia Fides) - "Interreligious dialogue is a commitment which should involve all of us. It should be an integral part of our life, in a Muslim majority country like Pakistan. In Karachi, one of the world's megalopolis, with a population between 19 and 21 million, a very high number of Hindu and Christian communities live. We are immersed in a truly multiethnic and multireligious society: there are also Bahai, Parsi and some Sikhs. Among the first who came to congratulate me for my appointment to Cardinal was a group of 15-20 religious leaders from different communities. It is very important: we are learning coexistence and mutual appreciation with them": this is what is stated by Cardinal Jospeh Coutts, Archbishop of Karachi in a note sent to Agenzia Fides. 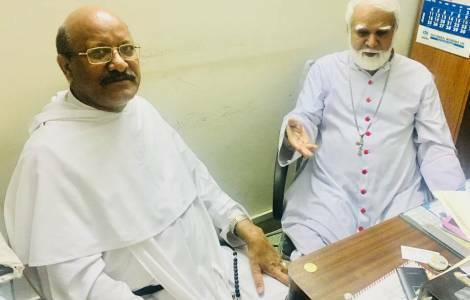 The Cardinal had the opportunity to talk about interreligious dialogue in Pakistan with the Dominican, James Channan, at the head of the "Peace center" in Lahore. As reported to Fides, the Cardinal noted: "Recently we have seen an increase of groups of extremists who use religion to foment intolerance. In such situation authentic dialogue is urgently needed which is something more than verbal dialogue: it is a dialogue of life, it means accepting one another, learning to understand each other, working together in harmony, in fact, already the document of the Second Vatican Council 'Nostra Aetate' addressed the question: As a Church we should not be closed in ourselves. We live in the modern world, and we are dealing with other religions. We look at the positive values in other traditions. In dialogue all these elements emerge. In Karachi, I am also pleasantly surprised to see how many people in civil society, of different paths of life and all faiths, feel this need, and are aware and worried about the emergence of terrorism and religious intolerance in Pakistan. They talk about the need to promote more and more interreligious harmony in society".